1959 Cadillac Convertible - Triple Black with 78,000 Actual Miles! Cadillac cars had a completely new look for 1959. From the front to the back this was the pinnacle of the space ship era. Cadillacs were always a symbol of someone who had made it and the '59 was designed to let everyone know it! 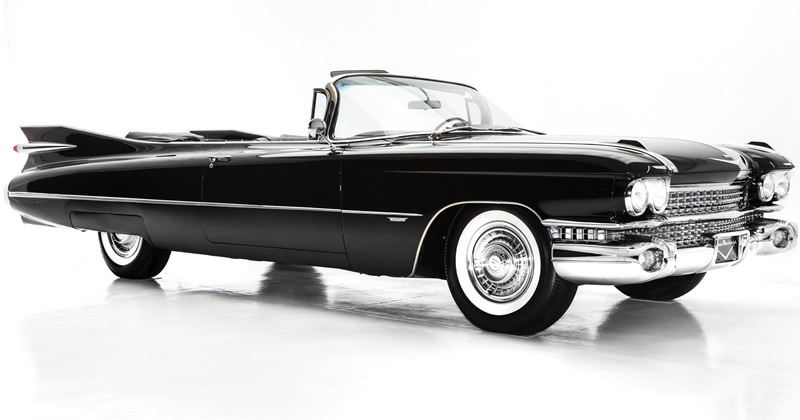 This triple black 1959 Cadillac Series 62 convertible has done just 78,000 miles in the, almost 60 years since it was built. One thing that you certainly couldn't miss were the fins! 1959 was the peak of fifties excess and no more so than the Cadillac models. 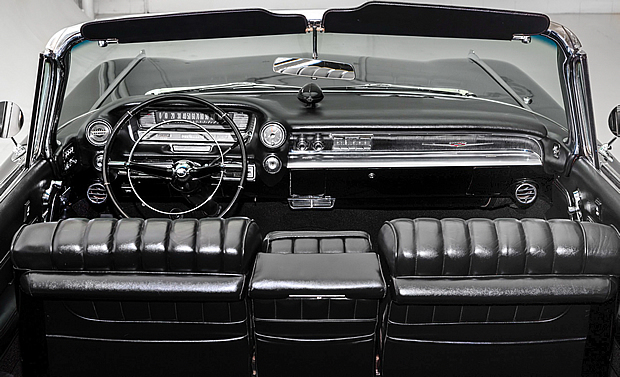 All-leather interiors were standard in the convertible. Eight different selections were available with two-tone combinations, solid colors and even metallic finishes. In the center of the dash you can see the Autronic Eye - an automatic headlight dimmer that was a $55 extra. Also new for '59 was the engine. 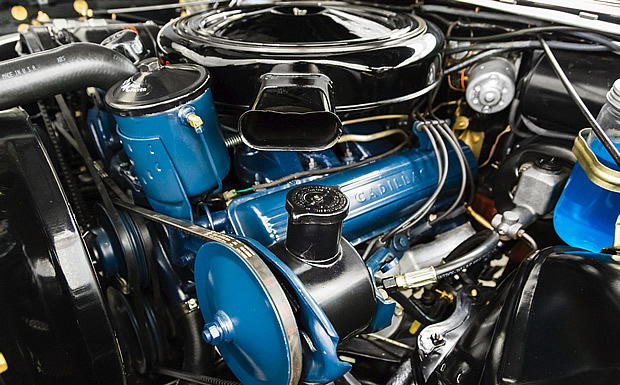 Gone was the 365 cubic inch V8 and in its place a brand new 390 cubic inch V8 engine producing 325 horsepower. This was paired with a Hydra-Matic automatic transmission as standard. Obviously, being a Cadillac, power steering and power brakes were standard. Convertibles also enjoyed powered windows and two-way electric front seat as a standard feature. And, of course, the convertible top is powered too. Time has proven this to be one of Cadillac's better V8s. Car sales could have helped being better than the 58 recession year. However they didn't come close to the 1957 figures. In total the 1959 model year saw a total of 11,130 Series 62 Convertibles being sold at a base price of $5,455. These cars experienced a period where they went seriously out of fashion and even described as tasteless. However, they have gone on to become a real icon of the fabulous fifties. Looks aside they are really good cars, were well built and give a lovely smooth ride. Just don't drive one if you don't like attention. A '59 Caddy is sure to grab attention wherever it goes!